Anara Spa combines the ancient healing traditions with island-fresh botanical essences to inspire lokahi – a balance or harmony of the body and spirit. 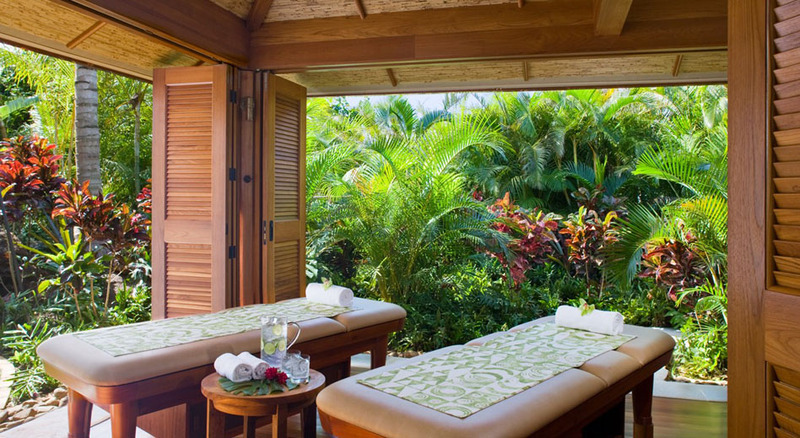 Learn how the open-air, 45,000-foot facility helps clients to achieve this phenomenon through massages, treatments and facials, as well as yoga and fitness classes, all with a Hawaiian touch. We spoke with Jessica Reid, the Assistant Spa Director, about the Grand Hyatt Kauai Resort and Spa’s luxurious amenities and signature treatments. Experience the premier spa on Kauai at Grand Hyatt Kauai Resort & Spa – Anara Spa. Anara Spa weaves traditional healing customs to inspire lokahi—unity, harmony, and balance. How is this achieved in your spa? Lokahi has layers of meaning that cannot be fully understood until they are felt. At the soul level, we all have an understanding of lokahi, regardless of where we come from or what language we speak. We are able to achieve this through a combination of a great team that truly understands and believes in lokahi and a location that naturally creates the perfect setting. The treatment menu was designed with a return to nature and focus on the inspiration of traditional Hawaiian healing. 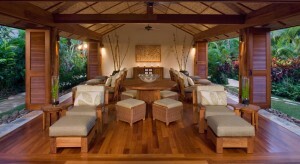 Our team is encouraged to give each guest an authentic, customizable Hawaiian experience. 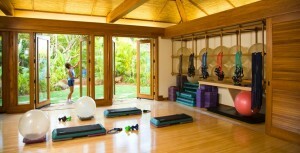 A light, open-aired hale exhilarates guests during fitness classes at Anara Spa. Your spa has more than 45,000 square feet of space, including a Garden Treatment Village. How does your concept and set-up nurture relaxing experiences? Our Spa has something for everyone. Whether you visit us for a quick workout or fitness class or you come to escape and relax, you are welcomed with the feeling of Aloha the moment you walk through our doors. Our space was designed to give you an appreciation of our Garden Island by making sure you don’t spend your entire experience indoors. Every area was designed to bring the outdoors in, and allows you to truly experience lokahi. Our locker rooms and pool areas open up to the sky above, but the real “gem” of Anara Spa is in our Lokahi Garden, where we can tailor a wide variety of treatments in your own private hale (house or building) while surrounded by the lush tropical gardens and cascading waterfalls. Private hales provide a pleasant, serene experience for every treatment at the Anara Spa. What is unique about your spa that makes it a must-visit destination in Kaua`i? Our Lokahi Garden makes us unique and a must-visit. When the original architects, Wimberly Allison Tong & Goo were engaged in designing the expansion, and it was clear that their vision was to make the most amazing spaces to receive a treatment. They were able to capture this by creating five hale with private rain showers and baths in this outdoor setting. They built the rooms to surround a centralized waterfall, so no matter where you are, you’re surrounded by the sights and sounds of nature. What is the most popular treatment/journey at the spa? We have the pleasure of being one of the top destinations for honeymooners, so our couple’s treatments are the most popular. Two of which are our Pilialoha (Romance) Journey and Kaua`i Ku`uipo (Lovers) Escape. Both transpire in our Lokahi Garden and ensure that we focus on their time together. 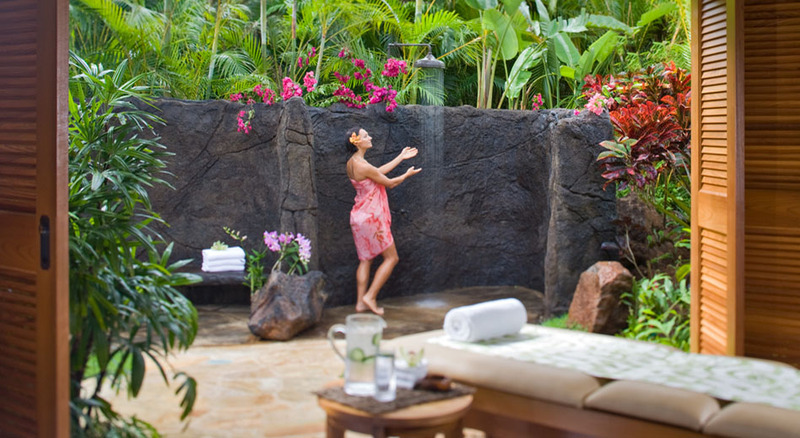 Luxuries such as outdoor rain showers for every hale make the Anara Spa a must-visit for any spa guest on Kauai. What spa treatments do you recommend for moms visiting? And dads? What about the kids? Natural, Hawaiian ingredients infuse every treatment at Anara Spa. Anara Spa is a great place for parents to get away and relax. As a parent myself, I know I’m always making excuses about having more time to do things, but as a guest of the Grand Hyatt Kaua`i, we offer the amenities for both parents and kids. Kids can have a great time with other kids at Camp Hyatt, while mom and dad retreat to Anara Spa which is conveniently located adjacent to Camp Hyatt. Personally, everything on our menu is great, but my favorite is our Kaua`i Clay Escape. It can be done separately or together as a couple. The treatment begins with a light dusting of the local `awa root, used to ease anxiety and insomnia which is massaged into the body with Pohaku (stone). Then a nutrient enriched mask of volcanic clay is applied with a warm herbal wrap to follow. The guest will then shower in their own private lava rock rain shower within the gardens and finish with a soothing massage of our local botanical lotion. What awards, if any, has the spa received? Relax in the common area of Anara Spa with its serene, indoor/outdoor experience. Since the spa industry is constantly evolving, we are always trying to create the best experience for our guests, while still remaining authentic and respectful to our past and the `äina (land). Experience a completely refreshed Grand Hyatt Kauai Resort & Spa with a $1.2 million refurbishment of the scrumptious eateries, including a complete renovation of The Dock, the poolside restaurant; the addition of a sushi bar at Stevenson’s; a modernized buffet at Ilima Terrace, and creation of a snack bar at the Poipu Bay Clubhouse. Also included in the refreshment are all new Grand Beds™, new fire pits, all new rubber mat flooring, Precor cardio and weight-training equipment at the fitness center at the Anara Spa, and more! Jessica Reid began her career at Spa Avania in 2008 at the Hyatt Regency Scottsdale Resort and Spa at Gainey Ranch. During her time at Spa Avania, she was cross-trained as a Spa Attendant and Massage Therapist, which contributed to her development and led her to the Grand Hyatt Kauai Resort & Spa in 2011. After arriving at the Anara Spa as a Spa Corporate Management Trainee, Jessica exuded exemplary leadership qualities and for three years, has been the Assistant Spa Director.